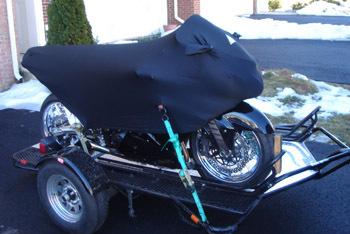 All GEZA Pro-Stretch Motorcycle Covers are designed to be towed on an open trailer at recommended legal highway speeds. However, because trailering enclosure, weather conditions and cross winds vary, always use caution, good judgment and common sense and slow down if conditions warrant. Before towing, ALWAYS clean and wax your bike, and follow the proper fitting instructions. If you have mirror openings, run your mirrors THROUGH the openings, tuck in the mirror draw cords and remove the Velcro SunShield Panel on the Sport-Classic Series size Small and Medium. Secure the foot peg loops with a cable lock and cover the bar/clutch/brake lever ends with a soft towel to prevent the cover from rubbing against rough bolt edges. Take antennae's off or run them through the cover by making a small slit in the fabric. Failure to do this may result in damage to the antennas. Use bar end or fork tie downs and make a 1"- 2" HORIZONTAL slit in the cover to allow the tow straps to pass through the cover, thereby not lifting the cover up and away from the bike to allow air and debris to enter inside the cover. The fabric is designed to be cut and will not rip, tear, abrade, or fray. NEVER tow your bike without the cover secured around your mirrors (if applicable), foot peg loops attached to the foot pegs and secured with a cable lock, and your tow straps coming THROUGH the cover. These securing measures will keep the cover properly secured to your motorcycle. If you notice the cover is flapping, this is almost always the result of improper cover fitting and strapping, excessive speed limit, or extreme weather and wind conditions. Check to make sure you properly followed the Fitting and Towing Instructions and slow down if conditions warrant. We offer a range of Fabric Series for you to choose from based on the amount of UV hours you plan on exposing your Geza Cover to. This way you can maximize the level of UV Block as well as UV longevity. For example, our Sport-Classic Series is rated to 2 UV Hours Per day, whereas our Elite-PLUS Series is rated to 15 UV Hours Per Day. The higher the UV hourly rating, the higher the UV block and longevity. Do NOT treat your Geza Cover with any UV fabric treatment sprays! Doing so may react with your Geza Gear Cover Material causing it damage. 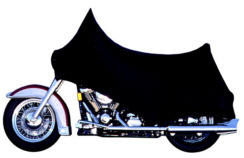 Great care and design has gone into each GEZA Pro-Stretch Motorcycle Cover to assure an optimum fit. The extra stretch in the fabric is designed to absorb wind impact while sitting outdoors or on an open trailer. For this reason please follow the Fitting Instructions as pertains to your bike and Cover Series as noted in the Fitting Instructions. 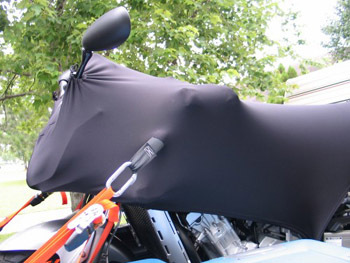 All Geza Motorcycle Covers can be water-proofed at your discretion. By aware that by water-proofing the cover, you will compromise breathability which can lead to moisture build-up and sun heat build-up underneath. As you go higher in the Fabric Series, you are also getting a denser material (to repel heavier rain forces), and you are also getting more advanced and protective water-repellecy treatments which will NOT compromise breathability. This way, you can have a motorcycle cover that can perform equally well as an indoor breathable dust cover and also a long-term outdoor cover. But, the Fabric Series you choose will be your best determination for the level of weather protection you need. Call us for further details or questions at 703.327.9844. Machine wash cold-water gentle cycle. Use just a LITTLE detergent if necessary but NO BLEACH and NO FABRIC SOFTENER. Or wash with just plain cold water. Dry in dryer on low heat for 5-10 minutes. If used daily outdoors, wash and dry the cover as recommended every 6 months to maintain the fabrics performance. If you notice a diminish in rain repellency, put the cover in the dryer on Medium High Heat for 10 minutes. The heat of the dryer will bring the water-repellency treatment back to the surface of your cover. Long-term Sun UV exposure will cause this to happen over time, so try this for a miracle fix!